Calpe on the Costa Blanca in Spain is an ancient fishing port full of culture and history. Today’s Calpe is also a high-rise beach resort that has managed to maintain its medieval streets and at the same time accommodate the demands of this age’s tourism. Calpe enjoys a perfect climate and is close to a lot of attractions. There is no wonder why it has become so popular with tourists from the UK and the rest of Europe. This magnet on the Costa Blanca has seen many tourists come and never leave! They have liked it too much. The beaches are excellent and you will find a wide range of quality restaurants serving food from almost all over the world. Calpe has turned in to the one place to dine even if you have to travel from other places on the Costa Blanca. Calpe offers some 11 kilometres of coastline from Les Bassetes to Morro de Toix. About half this coastline is sandy beach and half is towering cliffs. There are twelve sandy beaches most with promenades and bars, restaurants and shops. The two main beaches, Arenal and Fossa, are linked by a promenade two miles long. From the end of the Spanish Civil War in 1939 until General Franco's death, and the succession of King Juan Carlos I as head of state, the only language permitted in Spain was "Castillano". Basically this is also the same Spanish spoken in many South American countries. The local language is actually Valenciano and was brought to the region by the original settlers from Aragon and Catalonia in the 13th century. It is in use once again and, in fact, is taught in local schools. In the early days of the more permissive regime many roads signs, which bore the Castilian version of the place name, were defaced with black spray-paint. Quite recently the local nationalist movement has prevailed and nearly all road signs bear ONLY the Valenciano version of the name. 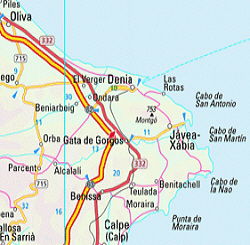 This has lead to some confusion as visitors sometimes cannot find their way as Jalón is now Xaló and Javea is Xabia. Do not miss out on the old town murals, monuments. All evidence of Calpe´s rich culture past. The Peñon de Ifach a huge rock that looks like Gibraltar is one of Caple´s most famous landmarks. It is a nature reserve with a wide range of birds and plants. If you are in shape and do not suffer from vertigo it is highly recommended to hike to the top of the Peñon de Ifach.